OS X is dead. Long live macOS! Indeed, as part of its WorldWide Developer Conference presentation today, Apple has finally decided to rebrand its desktop operating system. So no more Mac OS X, or OS X - it's macOS now, fitting with the naming scheme of all its other operating systems - iOS, watchOS, tvOS. The new software version that will be powering Macs is called macOS Sierra. Its most important new feature is the fact that it has Siri built-in, but it does come with other nice new things too. You can find Siri both in the top right, on the menu bar, and also in the dock. It can search for files, tell jokes, play songs in Apple Music, and interact with the entire Apple ecosystem of apps and services. So if you use all of those, you'll find Siri to be incredibly useful on the Mac. For example, you can have Siri do an image search for you and then you can use those images in Keynote. Siri can send messages for you too. And you can drag images, music, and other things straight from Siri search results and use them elsewhere. Auto Unlock will unlock your Mac when your iPhone or Apple Watch is nearby. Universal Clipboard is... just that. You can copy something on one Apple device (say, your iPhone), and then paste the same content on another (say, your Mac). What's more, the files you have on your desktop on one Mac will be synced onto all your other Macs, and even your iPhone. Next up, old files will automatically be sent over to the cloud, so they don't unnecessarily clog up your computer. This will happen automatically for stuff you haven't touched in a while. The files that are uploaded to iCloud will then be deleted from local storage. Apple Pay will be available in Safari. 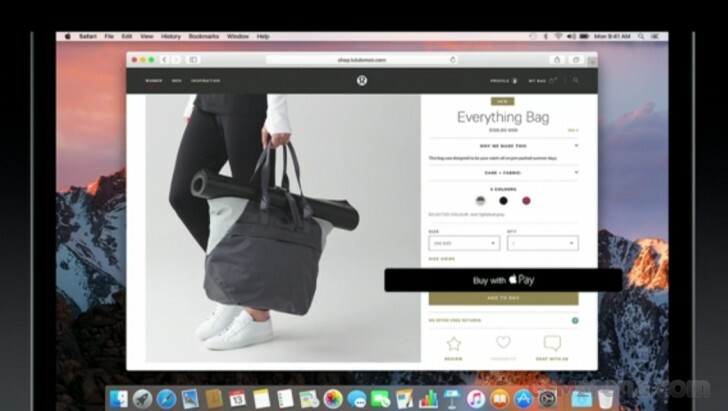 So when you want to purchase something from a partner website, you'll get the option to Buy with Apple Pay. Once you choose that, you'll need to authenticate the transaction using the TouchID fingerprint scanner on your iPhone, and that's it - payment made. And while we're on this subject, Apple Pay will launch in Switzerland, France, and Hong Kong soon. Another big new feature in macOS Sierra is tabs. Tabs everywhere, that is. In all apps. Expect this to happen even without developers modifying their code, though it isn't very clear how useful it will turn out to be. Finally, Universal Picture-in-Picture for Safari works in the same way as on TVs - the principle is the same, at least. For example, you can watch a video in a small box that's in one corner of the screen and remains on top of everything else. macOS Sierra will be out for developers today. A public beta will follow in July, while the final release is expected in the fall. Siri is way older than Cortana. Sierra has some nice new features, hopefully it's more stable than the current one. I also liked the rename to macOS it's more in line with everything else Apple makes.